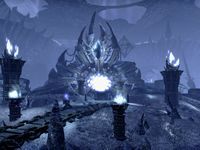 There are whispers among the Soul Shriven that the Planar Vortex and the Endless Stair were built for Molag Bal by the Mad Architect himself. 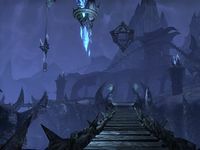 The Endless Stair is Molag Bal's citadel in northern Coldharbour. It serves as his last garrison of defense for the Planemeld. The Endless Overlook can also be found here. The Endless Stair Objective: End the threat of the Planemeld once and for all. The Final Assault: Launch an assault on the Endless Stair and destroy the Planar Vortex. 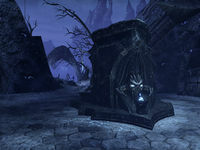 According to the Groundskeeper, Molag Bal is using this interstices of space and time as the primary staging ground to meld Nirn with his realm. There are a number of Imperial and Daedric-style buildings, as well as a constant mix of environment from both Tamriel and Oblivion. Endless Stair Wayshrine is located south of the stronghold, just north of the entry gate outside the Reaver Citadel Pyramid. This page was last modified on 19 November 2018, at 05:45.